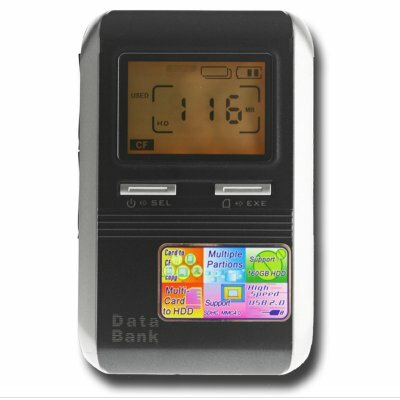 Successfully Added SATA HDD Data Bank - Multi Card Reader + LCD Screen to your Shopping Cart. SATA hard disk enclosure for high capacity data storage, with the ability to directly read and copy files from up to 9 different memory cards, and a large backlit LCD display. This one touch backup device is a God send for anyone constantly taking pictures or on the move, but without immediate access to a computer. This backup device is compatible with up to a 160GB SATA HD, with the ability to partition it in 30GB segments to keep all of your data safe Make data storage a snap with Chinavasions low price SATA HDD data storage device.